Add a Gigabit Ethernet port and a USB 3.0 pass-through port to your laptop through a single USB 3.0 port. The USB31000SPTB USB 3.0 to Gigabit Ethernet Adapter lets you add a Gigabit network port to your laptop or Ultrabook computer through a USB 3.0 port, and features an integrated USB 3.0 pass-through port that keeps your USB port available for use with other peripherals. The RJ45 port supports 10/100/1000 Mbps Ethernet and is fully compatible with IEEE 802.3i/u/ab standards. 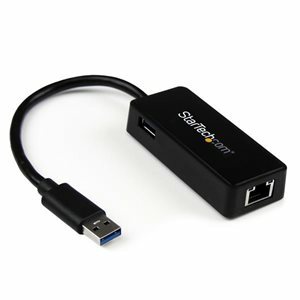 The network adapter is the ideal laptop accessory for your Microsoft Surface Pro 4, Surface Pro 3, Surface 3, Surface Pro 2 or Surface Book.An ideal replacement LAN adapter or laptop accessory, this compact USB 3.0 NIC leverages the 5 Gbps speed of USB 3.0 to provide full gigabit bandwidth and also offers backward compatibility with USB 2.0 systems (speed limited by USB bus).The adapter supports features such as IPv4/IPv6 packet Checksum Offload Engine (COE) and TCP large send offload to reduce the load on your CPU. Jumbo Frames, full-duplex operation with 802.3x flow control and VLAN tagging are also supported, making this an efficient and full-featured USB network adapter.